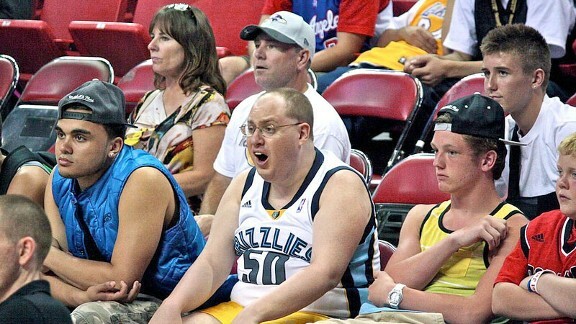 Superfan Brett Salapa: The bard of Las Vegas Summer League. Some in the crowd wonder if Brett Salapa will ever shut up. Most accept that he’s part of an eclectic scene in Las Vegas. His sideline antics are met with curious smiles, quizzical looks and, sometimes, annoyed expressions. But the NBA junkies quickly fall in love. A dad tells his son to get a photo with him. "This guy knows everything!" Salapa has attended every single Las Vegas Summer League since 2004. For most in attendance, summer league is a stop on the line, a step in the process, a window of opportunity. For Salapa, it's the only place where he can truly feel comfortable watching the game he loves, and since the beginning, his act has always been the same. If he sat quietly, merely observing the action, you wouldn't know Salapa from any other jersey-wearing aficionado. But he’s not quiet at all. Sitting in the first row, he’s the gym’s self-appointed play-by-play guy. Salapa calls the game out loud with vivid accuracy, and is missing only a color analyst by his side. He announces the result of a referee’s whistle before the call makes its way to the public address system. If points are accidentally assigned to the other team by the scoreboard operator, it doesn’t get past Salapa. A call doesn’t go the way he sees it? He will give his opinion otherwise. But it’s not just the action unfolding in front of his eyes, Salapa has an incredible ability to pull context out of thin air with his encyclopedic knowledge of pro basketball. Salapa has Asperger's syndrome, which, according to the Mayo Clinic website, is a "developmental disorder that affects a person's ability to socialize and communicate effectively with others," and where the person has "an all-absorbing interest in specific topics." Imagine you have trouble interacting with people on a social level. Most of us do to some extent. To be quirky is to be human. Because of his condition, Salapa doesn't understand social graces; he isn't aware of nonverbal clues. Everything for him is black and white. Salapa is 32 years old. His mother, Sharon Foster, takes care of him full time. He is capable of holding down a job, but his condition doesn't make it easy. He worked at a movie theater in Las Vegas at one point. "Boy, I really hate your team," he once blurted out to a customer wearing a New York Yankees hat at the cinema. That didn't work out so well. Salapa and his mother have lived outside of Denver for the past three years after residing in Las Vegas for seven. Sharon has yet to find him a job in Colorado. Salapa doesn't really have any friends. Services for those with Asperger's tend to disappear once the person reaches adulthood. Even grouping Salapa with others dealing with his condition isn’t ideal. He can't comprehend how to interact with those less functional. But once a year in Las Vegas, Salapa is just another basketball addict. He might attract funny looks, but by and large, it’s the one place where Salapa’s passion can be voiced without judgment. Summer league is his safe haven. “The rims in Vegas this year seem a lot more bouncy than in years' past," Salapa observes as shots continue to miss in a certain way. He pulls the names of marginal players out of his head, often mentioning if said player has had so much of a cup of coffee in the NBA and with what team. Salapa also will watch events such as the NBA draft as a primer for his time in Las Vegas. He remembers obscure biographical details about more recognizable players, the kind of stuff conjured by NBA broadcasters after hours of digging and often with the help of a research staff. “Waiters really killed my Clippers last year during Cleveland's early trip out West,” he says after a basket by Dion Waiters of the Cleveland Cavaliers. In early November, Waiters dropped 28 points on 7-for-11 3-point shooting against the Clippers at Staples Center. Prompted by my mentioning of Nick Young’s role in the Clippers’ amazing comeback from a 12-point deficit against the Grizzlies with a little less than three minutes left in a 2012 playoff game, Salapa starts rattling off other great comebacks in NBA history. “I remember back in 2002, Game 3 of the Eastern Conference finals between New Jersey and Boston, the Celtics were down like 20-something going into the fourth quarter and they came back and won that game,” Salapa recalled. Paul Pierce scored 19 points in the final period to give Boston a 94-90 win after being down 74-53 after three quarters. “Then again, they lost the next three and the Nets went on to the Finals, so it really didn’t matter,” he added before going on to mention Reggie Miller’s infamous "eight points in 9 seconds" heroics in 1995, and a 2002 regular-season game when the L.A. Lakers beat the Dallas Mavericks after being down 27 points to start the fourth quarter. Salapa was born in Fullerton, Calif., and grew up loyal to his hometown Lakers and Clippers. The “Showtime” days of Magic Johnson, James Worthy and Kareem Abdul-Jabbar got him hooked on basketball, but it was the voice of former Lakers play-by-play man Chick Hearn that sparked his passion for calling the game. As Salapa has gotten older, it’s been harder and harder for him to watch games live. He doesn’t handle losing so well. He can watch or attend a regular-season game under one condition: two of his three teams -- the Lakers, Nuggets or Clippers -- must be playing each other. This way, he knows that at least one of his teams won’t lose. Salapa also sometimes watches hockey and baseball, but the the rule stays the same. He and his mom will go see a Colorado Rockies game, but only if the Los Angeles Dodgers are in town. Salapa doesn’t feel as if he’s different, and that’s the thing that most Asperger kids don’t see, his mom tells me. He won’t see why people might laugh at him or talk about him. But ask Salapa why he loves basketball and his answer is the same as anyone else’s. With seven games being played on most days, four in the Cox Pavilion and three at the Thomas & Mack Center on the campus of UNLV, Salapa has a specific plan. When the buzzer sounds at one game, indicating the end of the first or second half, he scurries off to make the five-minute walk between venues. It’s important to him that he sees all of the teams; it’s part of his need for structure that’s dictated by Asperger’s. Sharon lets Salapa roam freely from Cox Pavilion, the smaller venue at Thomas & Mack Center, to the main court next door, but isn’t completely comfortable dropping him off at summer league for the day; she often can be found reading a book while Salapa is off by himself in the big gym. During Salapa's first couple of years at summer league, a few in the surrounding crowd would give him a hard time, tell him he was annoying. Not so much anymore. The staff working the event take extra care to ensure Salapa is comfortable, often stopping by to say hello or getting him extra tickets for a day. In his first year, his play-by-play calls were noticed by former Sacramento Kings owner Joe Maloof. After a game, Maloof stopped by and connected with Salapa, later sending him a Kings jersey. Twice in the past several years, Salapa has put on a headset for official duty with NBA TV, getting the thrill of sitting next to Rick Kamla and Steve Smith to call the last few minutes of a summer league game. As he and his mom leave the gym on their last day of almost a week in Las Vegas, I tell Salapa that I must ask about the Memphis Grizzlies’ Zach Randolph jersey he’s wearing. Salapa is a Lakers, Clippers (and Nuggets) fan -- he had worn the jerseys of his two Los Angeles teams the previous couple of days.